I’m a long-time customer and unashamed fan of Thrive Themes and Thrive Leads (full disclosure, affiliate links). I think they make some of the best damn WordPress software on the planet. I use Thrive on this blog, on my other blogs, and if I start another blog I’ll use Thrive there too. The Thrive Themes package comes with Thrive Leads, one of the most complete systems for collecting emails on a WordPress site. 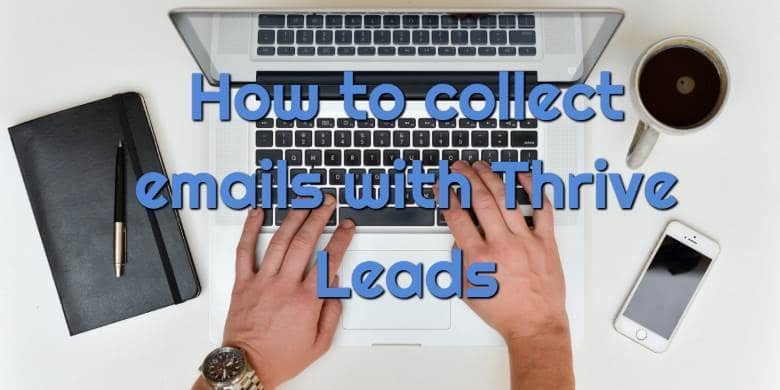 This article will explain how to collect emails with Thrive Leads, including some best practice tips and some “gotchas” you need to watch out for. Let’s get started building a monster email list! Thrive Leads is a module in the overall Thrive membership package. This package is a massive bundle of premium WordPress themes, a site / landing page builder called Thrive Architect, a quiz builder, headline optimizer, comments and widget manager, and other stuff I haven’t even had a chance to play around with. But this article is about the prize jewel in the Thrive crown: Thrive Leads. This is how you capture email addresses, and there are a huge pile of options. It is easy to get overwhelmed and either not know where to start or to make mistakes, so I’m going to show you how to build a list with Thrive Leads, step by step. The main concept you have to get your head around in Thrive Leads is the lead group. Until you understand what a lead group is and how they work, you will be struggling. A lead group is simply a collection of one or more lead forms that might appear on a page or post in WordPress. So it could be a lightbox. Or it could be an in-content form, or an in-content form and a post footer. Or some other combination. You will definitely need to create a bunch of lead groups for your site. And that’s because of the golden rule of lead groups, which a lot of people get caught and confused by: each WordPress post or page can only have one lead group active on it at a time. It took me a while to wrap my head around this. Basically, you don’t go creating a bunch of lead forms and then choose which pages the forms appear on. Well, you could do that, and just have groups consisting of one form type. But then you could never have a page with more than one form type on it. What you should do instead is think of the types of rules or categories of forms you will want to have, and build lead groups for each of those (plus you’ll need extra ones for landing pages, we’ll get to that in a bit). So for example, for my SEO category pages, I have an in-content form (I really like these) with an SEO related lead magnet offer that appears after a few paragraphs. But I also have a post footer for people who get to the bottom of the article without opting in. So I have a lead group consisting of those two forms, and I apply it with a visibility rule linking it to my SEO pages (I’ll explain more about that in a minute). Then for my Blogging category pages, I have an in-content form with a blogging related lead magnet, and I also want the catch-all post footer. Which is exactly the same as the footer form on the SEO pages. But you have to duplicate this footer form and add it to each lead group. You can’t have a lead group just with the post footer and try to add it to the existing categories, because of the golden rule: each page (or post) has one and only on lead group active on it at a time. So you have to put all the forms you want to appear on a particular page in the lead group for that page. Luckily, Thrive Leads lets you easily copy an existing form by saving it as a template. We’ll get to that in a bit. In-content – this displays a small form in the middle of your blog post content. You can specify after how many paragraphs it will appear. I like in-content forms because they blend well into the content and are not very disruptive. Lightbox: the infamous lightbox, I’m sure you know these well. They do convert at a high rate but are disruptive for the user experience and I’m starting to move away from them. Post footer: This is a form that appears after all the content of a post or page (though before the extra bits like Related Posts). These can be nice for catching people who fall through all your other nets on the page. Ribbon: This is a small form that appears at the very top of page content (basically the opposite of a post footer). Screen filler: This is like a lightbox but even more disruptive – it smothers the entire screen (unlike a lightbox, which sits in the middle and partially obscures some of the page where it is sitting over it). Scroll mat: Like a screen filler, but it slides in over the screen. Slide in: like a scroll mat, but much smaller (about the size of a small sidebar widget). These are attention-grabbing without being very disruptive. Widget: these sit in the sidebar of a WordPress site and are very common. They are not very disruptive but don’t tend to convert very well. You can also insert forms via Lead Shortcodes, which is actually very useful for building landing pages (which we’ll get too later). So there is an enormous number of options. And each form type has a big pile of templates for you to choose from. Thrive comes with an extremely powerful page builder / site builder tool called Thrive Architect. This basically lets you drag and drop elements on a page and style them however you like, a bit like Clickfunnels (but it costs $20 per month instead of $100 per month, nice!). So not only do you get all those types of forms, and each form has dozens of templates, you can also edit the templates to get them looking just how you want. Which is great. You should obviously use Thrive Architect to change the forms to make the styling and copy match that of your website. Once you have added a form type, you edit the form, save it and add it to the group. You can then, however, create another form of the same type within that group. What this will do is immediately set up an A/B test. Thrive will automatically distribute traffic randomly between forms of the same type (e.g. two in-content forms) within a lead group. Which is very handy for optimizing your title, copy or images. Once you are getting a decent amount of traffic to your site (enough to create a statistically significant sample for an A/B experiment), you should set up A/B tests on your form sites and check in once a week or so, to kill off losers and create new challengers. This is easy in Thrive because you can clone an existing form with a click of a button, change some text or whatever, and save it. Now you have a new A/B test! Visibility and priority rules for lead groups are really important and this is where you can get tripped up. Remember, you can only have one lead group active on a page at a time. So you define the visibility rules for your lead groups, and then put all of them in a priority order. Thrive will go through the lead groups from the top to the bottom, matching the visibility rules against each page and post. Visibility rules can match a lead group against a post category (very handy), post tags (possibly useful), or Format or Symbols (I’m not really sure what they mean, but they could be relevant depending on how your website is set up). You can also set visibility to be based on a page type or template. Lead groups can also be made visible or invisible for desktop and mobile. This might be handy if you are concerned about how disruptive and annoying lightboxes are for mobile users (and if you aren’t you probably should be because Google is and they are starting to punish websites that throw up blocking lightboxes on mobile browsers). So, for example, you could have a lead group with a lightbox that is active on desktop, and another one with the same forms minus the lightbox that is active on mobile. What I do is set up lead groups for my page categories, with a couple of form types (a content upgrade one and a generic one). Then I have a catch-all lead group with a general in-content form sitting at the bottom of the priority list, for posts that don’t match against the category lead groups I have set up. So that way, every page gets at least some kind of lead form on it. Works well. The priorities for lead groups is actually simple – it’s literally the order of the lead groups themselves on the dashboard! You just drag and drop them around and put them in whatever order you want. So you obviously want the most specific rules at the top and the most general rules at the bottom. Thrive lets you create landing pages and squeeze pages too. I do this with a combination of Thrive Leads and Thrive Architect. Though there is one little annoying thing that I wish Thrive would fix. So Thrive provides a dashboard with a nice graph and metrics that shows how all your lead groups and forms are working over time. But these metrics only work for lead groups. If you go and set up a landing page with Thrive Architect, by starting with a template or a blank page and adding lead form controls onto them, it will never show up on the dashboard! So you will never see any numbers on how it is performing. I think this is crummy and one of the only flaws I find with Thrive. I’ve complained to Thrive about it and they haven’t fixed it (yet). But luckily, I have found a workaround! I mentioned a while back that it can be useful to create forms with shortcodes. And this is how it works. What you do is on the Thrive Leads dashboard, add a new Lead Shortcode (this will give you a short bit of code that you can slap onto a page to add a form wherever you want it to appear; shortcodes are a well-known feature of WordPress). You go and edit the Lead Shortcode to be whatever you want (a lightbox or in-content form or whatever). Now this Lead Shortcode is considered by Thrive to be a Thrive Leads form and it will appear on the dashboard, with its conversion stats. Which is great. Then all you have to do is add it to a landing page! Create a new page in WordPress, and instead of writing anything in the WordPress editor, choose Launch Thrive Architect. Then in Architect, set it first as a blank landing page template. Then you can add a Thrive Leads Shortcode element to the page, and put in the shortcode you created before. Now you have a custom squeeze page with Thrive Leads form and you can see your metrics on the dashboard! Cool stuff. That’s how I just built this simple landing page, in fact. Which took me about five minutes in total. Including linking it to my autoresponder. Anyway, I hope you’ve found this a useful introduction to how you can start collecting emails with Thrive Leads. If you have any questions about Thrive (it’s a pretty big and overwhelming tool, I’ll admit), leave them in the comments!